Commercial Flights To Resume From U.S. To Cuba : The Two-Way Restrictions on visiting Cuba will remain, but authorized travelers can soon fly directly from American airports to the island nation. Currently, charter flights are the only air travel option. 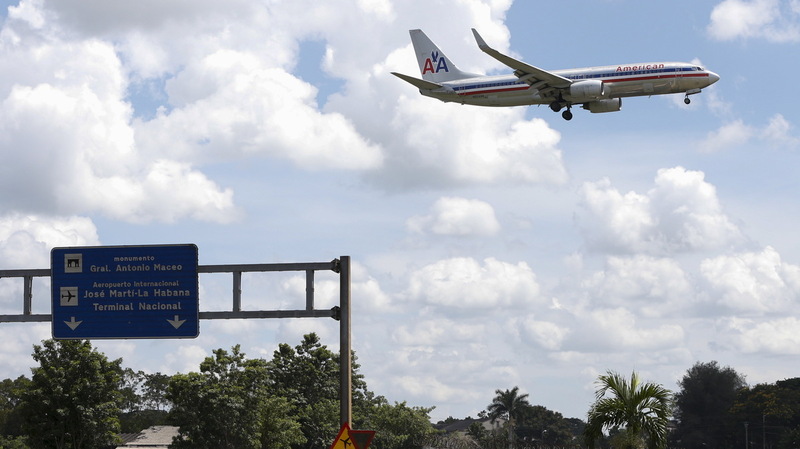 An American Airlines airplane prepares to land at the Jose Marti International Airport in Havana on Sept. 19. Currently charter flights (including American Airlines charters) are the only way to fly between the two countries, but commercial flights are set to resume under a new aviation agreement. Commercial airline flights are due to resume between the United States and Cuba — a step in the ongoing thaw in relations between the two countries. State Department officials announced the aviation deal Thursday, a year after President Obama and Cuban President Raul Castro began the process of restoring diplomatic ties. "In the past year, the two countries have forged agreements on combating narco-trafficking, preserving the environment and re-establishing direct mail. "But many sticking points remain before full relations are restored. Cuba wants the U.S. to lift its economic embargo and pay reparations, which the Castro regime says top $120 billion. The U.S. is seeking $18 billion for property seized in the communist takeover, and an improvement in human rights. "Most tourists still cannot legally visit Cuba, but a State Department spokesman says having a stronger aviation relationship will promote authorized travel and improve people-to-people contact." Some details still need to be worked out, and U.S. planes won't be landing in Cuba immediately. Charter service — currently the only air transportation options between the two countries — will be allowed to continue at an unlimited frequency, Humphrey says. No commercial flights from Cuba to the U.S. are included in the initial agreement.